Favorite book: I’ve tried to narrow down my “favorite books” list, but can’t seem to pick one above the others. It all depends on the genre. Favorite board game: Axis & Allies by Milton Bradley. Second would be Kings and Things. Favorite wargame: Third Reich by Avalon Hill. Second would be Nomad Gods. Juegos y Dados – Welcome Rick, thank you so much for your collaboration. It is a big pleasure that you are here with us. Rick – It’s a pleasure to be interviewed. I’m always happy to talk about one of my favorite subjects – games. Juegos y Dados – First of all, I would like explaining something. I am doing a round of interviews of the most famous role-playing designers in Spain also. Would you like know that the question of favourite role-playing game until now is more than 80% in favour of your Call of Cthulhu? Rick – I got introduced to RPGs when I was about 11 years old (1977). I was chatting with some neighborhood kids and one of them told us what happened in the session of D&D he was playing. I went home and asked my parents if I could buy a book (D&D) at a local hobby store. Fortunately, they always were happy to buy us books, so I got the Holmes Basic boxed set of D&D. I loved designing dungeons, moving minis around on the game table, and rolling all the different dice as I sought out loot and glory. I got into a gaming group with some of my friends at school and we started playing 2nd edition D&D. We spent a lot of summer days and weekends playing through the Against the Giants series of modules, all the way up through Vault of the Drow. It was shortly after that that one of our group, Tim, asked us to try a new boxed game he had bought called RuneQuest…. Rick – I started with Holmes Basic D&D, and then I tried several other game systems, such as Tunnels & Trolls, and Traveller before settling into a long RuneQuest Campaign. 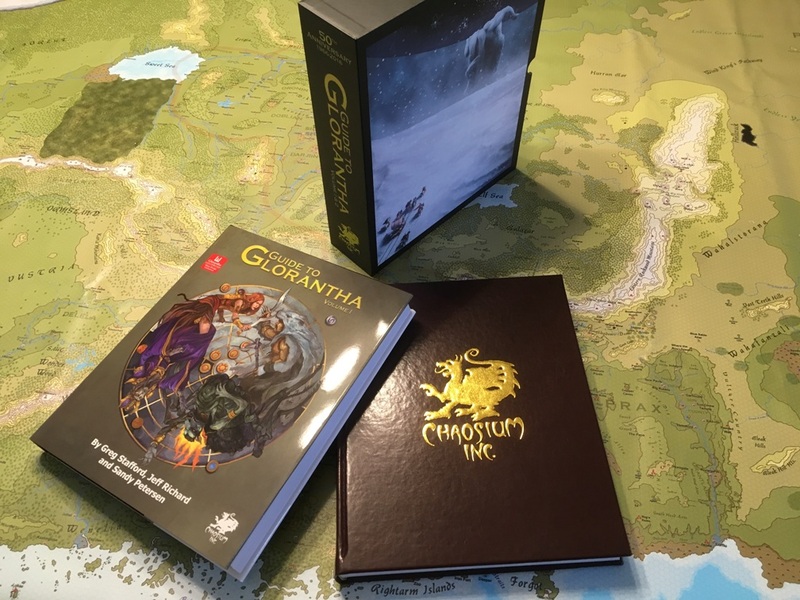 Juegos y Dados – You are a fan of Glorantha. Could you explain us the story? Juegos y Dados – You were called “Mr. Suitcase” or “Monsieur Valise”. Could you explain us? Rick – I picked up that nickname as part of my collecting habits. I am known as a “completist” collector. If there are 20 books in a series, I must own all 20 of them, and with RuneQuest and Glorantha I wanted to own one of EVERY publication. Back in the late 1990s there was a very active online group that would discuss all things RuneQuest and Gloranthan in nature. Lots of the people would ask things about rare or obscure publications, and I was usually the guy who would comment on what they contained since I had those books on my shelf. One of the Frenchman in the group took particular offense at me not making photocopies of rare things available to other people, which I politely refused. He called me “Mr. Suitcase”, which in French is basically “Monsieur Valise”. I hadn’t heard the term before, but he explained that it was used to describe MtG players who have every card for game, including the ultra-rare and very powerful cards, all in plastic sleeves and organized in a big suitcase. Even though he meant it in a derogatory way, I embraced the term and have used it jokingly ever since. My Gloranthan friends call me that to this day. Juegos y Dados Was the Meints Index to Glorantha your first creation? Why? Rick – While I have been involved in the production of many publications, the Meints Index to Glorantha (MiG) is my only book. I have written a few articles for magazines like Tales of the Reaching Moon, but that one book, and its two editions, is the only big body of work I have written. I wrote it because I was getting tired of remembering where specific articles were in old fanzines, or which supplement documented a certain spell. Sifting through a few hundred items to find something was too time consuming, plus I had other people asking me about what was in various hard to find publications since they knew “Mr. Suitcase would have a copy of that”. 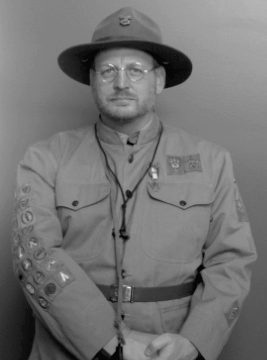 Rick – I have played in many RuneQuest sessions, but my favorite funny moments would have to be in Gloranthan LARP’s. During some of those freeforms I witnessed some amazing and often humorous scenery chewing by my friends. In a jousting tournament my good friend Dan Barker was playing a knight who had no horse. I was a shape shifter who could turn into a Moose and I offered to be his “horse”. We didn’t win but we have a saddle pouch full of stories to share about it. In that same game we would paint our tribal and religious runes on everyone we converted to our faith with a small paintbrush dipped in blue paint. After a while many people asked us if they could get “painted up” just to join in on the fun. The next morning, long after the paint had been washed off, we still saw many sunburned faces who had those runes remain on paler skin. Juegos y Dados – Why did you found Moon Design Publications? Rick – I founded Moon Design with Colin Phillips because we wanted to get many old, popular RuneQuest supplements back into print. By 1998 Avalon Hill was done publishing anything for RuneQuest, and the void was getting harder and harder to ignore. Even though I am a collector and love being an auctioneer for collectable RPG items, I’d rather see books get into the hands of gaming groups that want to play them, not just buy them and put the scarce item on the shelf. Rick – I have met several famous designers, mainly at conventions where they were a guest of honor and I was an attendee. I have also emailed many more authors over the years as I have researched various things as part of reprinting old material they had written several decades earlier. Categorically they have all been helpful and friendly. The first game designer I met was Greg Stafford, at RuneQuest Con I (1994) in Baltimore, Maryland. I had brought a large box containing my RuneQuest 2 Chaosium collection and he patiently sat down with me, chatted a little about each book, and put up with me pestering him to autograph about 20 items. Towards the end of out time together he said “you should be a RuneQuest historian since you have such a complete set of stuff”. Juegos y Dados – We interviewed Sandy Petersen and Greg Stafford months ago. They are nice people. Could you explain us any fun story? Rick – Greg and Sandy have both hosted seminars at countless conventions. Because they have often gone to the same Gloranthan conventions that I have, like 6 RQ Cons, 7 Convulsion cons, and over 17 cons in Bacharach (Tentacles and Eternal Con), I have had many weekends of fantastic opportunities to hear many of their stories and gaming experiences. They are both wonderful to play RPGs with. They have that creative spark in them that makes most other people stand in awe while they explain their latest thoughts and creations. My favorite little thing about Sandy is that he has worn the same outfit to conventions for the last 20 years. If he has on blue jean shorts, a white t-shirt and suspenders, I know that Sandy hasn’t been possessed by aliens. As for Greg, I can’t help but think of how he must wear a shirt that has a pocket. Greg is always writing things down in a small notebook. He wants to savor every moment by recording it, so he can remember it for years to come. I can only imagine how many of those little notebooks he has in his office…. 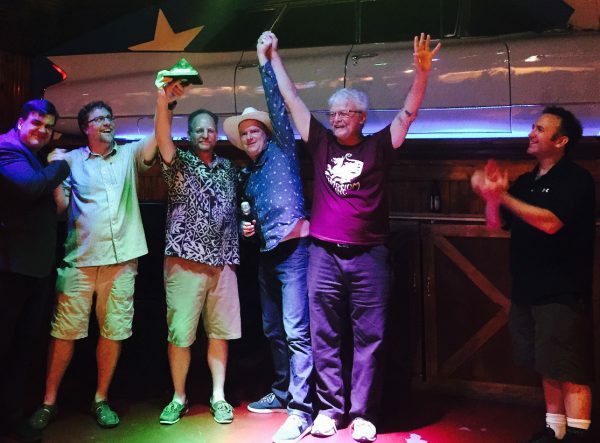 Juegos y Dados – What did you feel when you formally became president of Chaosium with Stafford? Rick – Shock and awe. 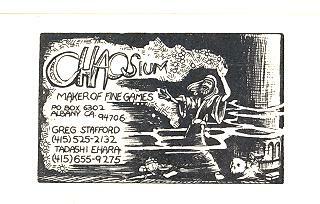 Rick – I grew up with Chaosium games, as did Jeff, MOB, and Neil, the other principle partners in Moon Design, and the managing team of Chaosium. This has been a 40 year journey for us since the time of our youth. Picking a favorite is not an easy task. I love Griffin Mountain because it was the first campaign where I felt I was doing something beyond gathering treasure while I worked on Joh Mith’s caravan. Meeting Gonn Orta is not something you are likely to forget. I love the early issues of Wyrms Footnotes because they are raw and human and creative. They show a company trying to build a tribe of followers by being raw and honest and vulnerable. 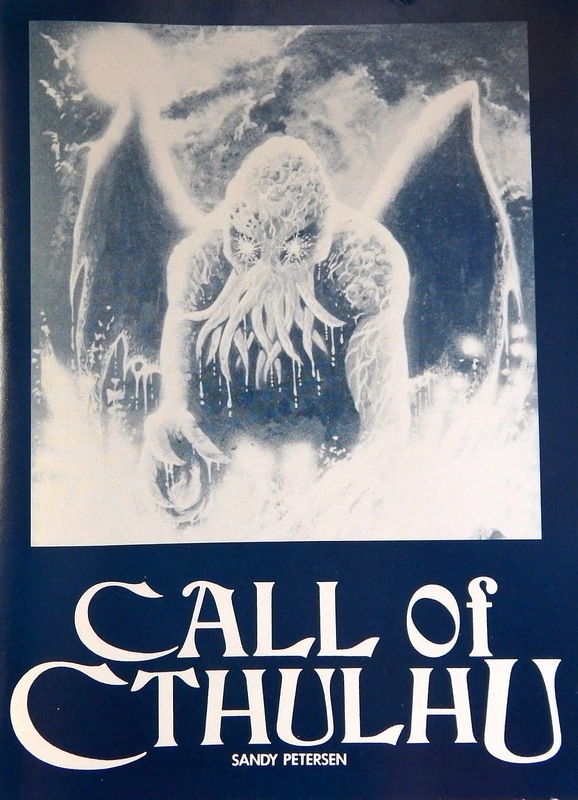 The early Call of Cthulhu publications make you sit back in wonder because they show how much the world of horror is more than gore and guts. It is cerebral and esoteric. It is humanity at its most vulnerable as it seeks to find its way in a far greater scheme of things. On a larger level, every boxed set that Chaosium did in the early 1980’s is an opus of work that has yet to be matched in the Roleplaying Industry. In the end, I cannot pick a favorite child. Rick – As a gamer, I happened to be in the right place at the right time to experience the Golden Age of Chaosium. I had the honor of playing RuneQuest, Call of Cthulhu, Stormbringer, and Pendragon all as they came out in the late 1970’s and early 1980’s. My favorite system is the Chaosium Basic Roleplaying percentile system, a system that is not bound by character classes, experience points, armor restrictions, or weapon choices. I loved being an Issaries Rune Lord, a gangster with a Thompson submachinegun full of silver bullets, a worshipper of Straasha who drowned my opponents, and a Knight who seemed to always fail his chaste role. Juegos y Dados – Would you think writing any role-playing game in the future? Rick – Chaosium is all about innovation and the unexpected. We are, after all, not the Orderium. The new Chaosium has no desire to rest on its laurels. I have more writing left in me. Juegos y Dados – You are going to reprint The Guide to Glorantha, a roleplaying game supplement not written for any particular role-playing game rules system, written by Greg Stafford, Jeff Richard and Sandy Petersen. What do you explain about this? Rick – The Guide to Glorantha is unique in the world of roleplaying games. It is the most definitive set of information for a fantasy game world published in a single publication ever. It’s an homage to that magic combination of three creative geniuses. It has fifty years of Greg Stafford, thirty years of Sandy Peterson, and the passing of the torch to Jeff Richard. Together they have created a game world that stands head and shoulders above the rest. I was humbled to do the layout, finding ways to make their world come to life on the printed page. Juegos y Dados – Chaosium is starting with board games also. 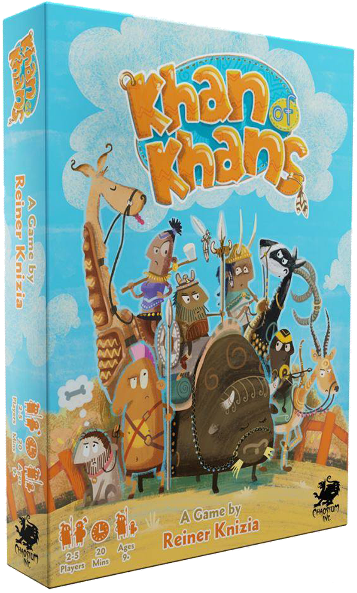 You have a crowdfunding in Kickstarter of Khan of Khans, by Reiner Knizia, a board game set in world of Glorantha. How the idea was born? Rick – I got to know of Reiner Knizia’s games when I moved to the UK in 1995. 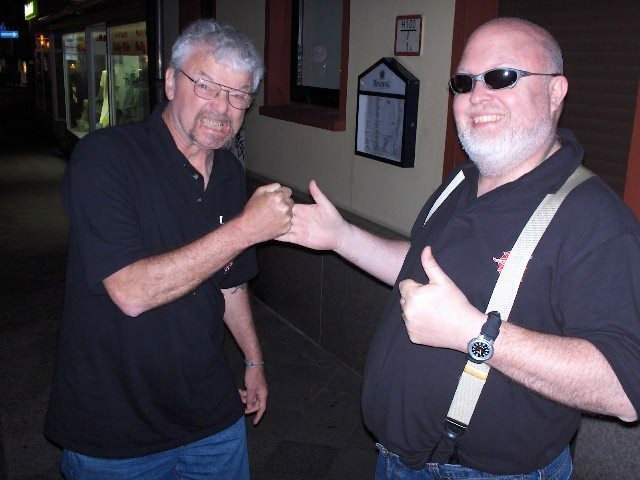 One of his key playtest people is Kevin “Big Jack” Jacklin, who happened to be a member of Tales of the Reaching Moon and also the Convulsion Convention committee, which I got to be a part of, as did MOB. We always have time for Kevin. He is a kindred spirit of gaming and a night at the pub is not the same without him. When the new Chaosium was launched in 2015 we knew that we needed to re-enter the realm of board games. It was something Chaosium was noted for almost 30 years prior. Reiner’s name was at the top of our list of designers we wanted to partner with, and Kevin helped pave that way. MOB ran with the idea of taking a Reiner game and making it Gloranthan. Fast forward to today and the Khan of Khans Kickstarter raised $47K. Thus begins a new boardgame chapter for the new Chaosium. Juegos y Dados – Do you think publishing any new role-playing or board game in the future? Could give us any details? Rick – We have a number of projects in the works. Alas, it is mainly about how to shoot at so many targets with a limited supply of arrows. I’d love to say more, but in this very competitive market I can’t tip our hand so early. 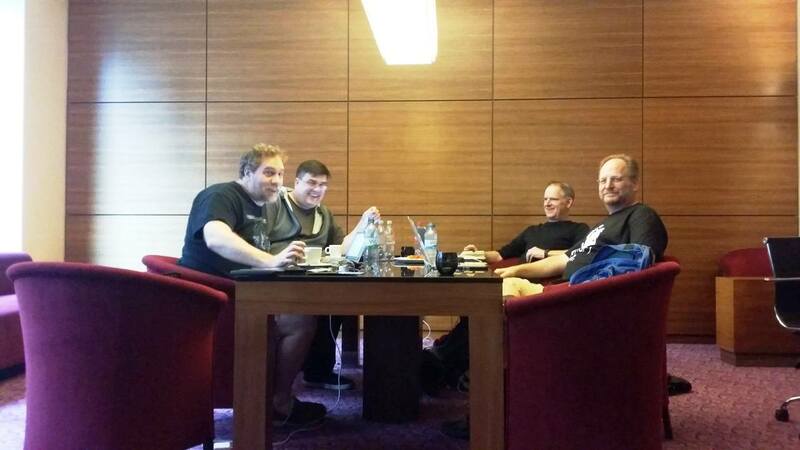 Rick – Thank you for letting me share a bit about the new Chaosium, and a bit about me too. I feel honored to share those stories. Siguiente Entrada siguiente: Reseña de Castlecards, ¡Asalto al Castillo!